Hospitals and schools still lack proper facilities and medicinal drugs despite millions of kina being spent by the government to improve the quality of health and education service in Papua New Guinea. The PNG community based in the Australian city of Cairns, in Far North Queensland, has formed an organisation ‘The Heartbeat’ to support PNG with better health care equipment and education materials. The team members who arrived in the country last week, were at the Salvation Army in Port Moresby over the weekend to distribute medical and school materials to areas in great need for them. The team organiser, Alison Geno, said around A$25,000 (K66,000) was spent on transporting a shipping container full of medical and educational materials to PNG. 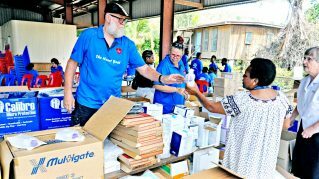 Ms Geno said the donation was the third since the organisation was formed four years ago, focused on improving the health and education of ordinary Papua New Guineans. “In Cairns we have better health facilities and we want to also give to our loved ones in PNG the better health care services in any way we can,” Ms Geno said. She said the team receives donations from hospitals and nursing homes in Cairns, and also buy with money raised through community events, and fundraisers. “We focus on PNG because of the link we have as former residents to give something back to the country. We want to get up to the Highlands, the New Guinea Islands and many other areas in the country however, it will all depend on the money we can raise. “We have all our love ones back here who need better medical care. We are about coming together to save lives,” Ms Geno said. The latest medical materials will be given to Kerema hospital, (10 electric hospital beds for patients), Salvation Army’s health centres, Cheshire disAbility Services, Port Moresby General Hospital and the education materials will be donated to different learning centres and schools throughout. Cheshire was proud to collect 10 wheelchairs from the team yesterday.